Last week while working on an article related to the Black Heritage Postage Stamp Series in light of Black History Month for my Examiner.com page, I put together a slide show of some of the men and women featured in the collection. 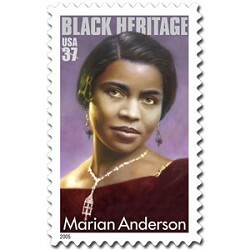 Among those faces that grace the stamps is Marian Anderson, a vocal artist of extraordinary talent who left a legacy as one of the admired and respected persons of the 20th Century. ” I have fondest recollections of my meeting the famous contralto during my final year at Purdue University. Alpha Phi Alpha, the fraternity that I was a part of at the time, had just acquired a fraternity house on campus. That accomplishment was certainly historic for the black frat but not altogether recognized and celebrated as such at the time. When I learned that Ms Anderson was offering a recital at Purdue as part of her farewell concert tour before retiring from the concert stage, I wrote to her and asked if she would consent to on our having a reception in her honor at our house. She was staying at the Purdue Memorial Union where she had broken the color barrier with her being the first person of color to stay at the hotel facilities when she first sang on campus back in the 1950s. Our fraternity house was less than a block away, and she graciously accepted the invitation. When I met the renowned concert artist, I recall recognizing greatness in this woman of magnanimous spirit. In the presence of “greatness” there is an aura of reverential respect, one almost desires to bow or genuflect or demonstrate some gesture of obeisance; it seems as I recollect, an almost automatic response to overwhelming greatness. Without question my meeting Marian Anderson was one of the highlights, not only of my college career but of my life. As I continued to reflect upon past events, I realized that we are presently in the period between Ash Wednesday and Resurrection Sunday. An event of profound significance occurred in 1939 during Holy Week when Marian Anderson was scheduled to perform at Constitution Hall, which was owned by the Daughters of the American Revolution (DAR), but because she was African America, the DAR refused to allow her to use the facility. Eleanor Roosevelt, wife of President Franklin Delano Roosevelt, resigned from the DAR in protest and supported the NAACP as it organized an Easter Sunday concert on the grounds of the Lincoln Memorial, with more than 75,000 Americans attending that outdoor event. Here is a news clip of that momentous event. we read the news of her passing. of talent, grace, and humility. a voice that comes but once in a hundred years. To cross over the swelling Jordan is my goal. Above my tableland to overwhelm my soul. But I prepare my heart and mind for victory. So shall those who trust you, never fail but succeed. I shall walk through this Jordan and stand on dry land.